The above photo is one of mine which will be on view and for sale at this weekend's one-night-only photography popup. 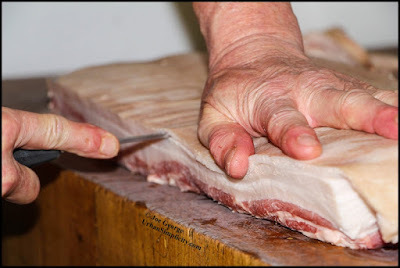 The photo is titled, "Makin' Bacon," or alternatively, "Flesh on Flesh." I'm one of 10 or 11 photographers displaying their work. All photos are unframed and for sale at a mere $25. "The photography pop-up series is intended to exist outside of Buffalo's mainstream art scene," says Molly Jarboe, co-organizer. "The pop ups are never at a gallery, sponsorships will never be accepted, and work will always be sold at or below cost. This is a people's art event." "This series is a departure from his usual work in that he shows close up views of kitchen life and the juxtaposition of beauty and grotesque, both of which are present in the image of the butcher preparing a pork belly for bacon. 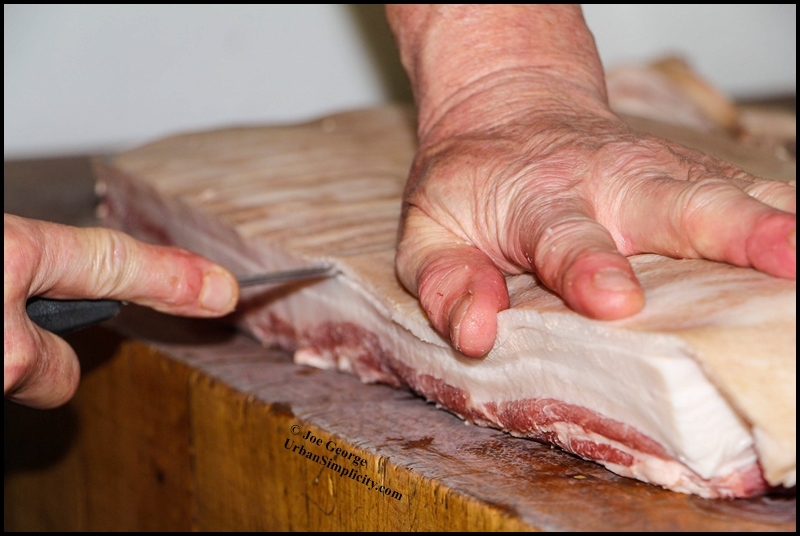 The flesh of his hand is pressing down into the flesh of the pig, restraining it but in a way communing with it. Though you'd likely recognize some of the names of the hands in these photos, Joe has chosen to keep them nameless in honor of all the line cooks, prep cooks, and dishwashers who often toil unnoticed behind the kitchen doors. For some, who have never worked in a kitchen, they may have the misconception that it's like a television show and all glamour. In snippets it can be, but mostly it is the day in and day out routine of the job. Some days you're cutting meat, some days vegetables. It's always hot. And then some days you're simply buttering toast, lots and lots of toast, for a Sunday brunch." To see the official Facebook page, which describes the popup more fully, click here. To see the show profiled at Buffalo Rising click here. To see the show profiled, along with sample photos, at the Buffalo News, click here. This should be a fun show, I'm really looking forward to it, and I hope to see you here. Oh, and one more thing, I've been told there will be free beer courtesy Community Beer Works.